Recently, well known mystery writer Sue Grafton died at the age of 77. She titled her books with an alphabetic device – “A is for Alibi”, for example. I borrowed her idea for several of my blogs. Today, “F is for Fortuny”. Spanish-born textile and fashion designer Fortuny (1871-1949) studied many of the arts: painting, sculpture and photography. His interest in the effects of lighting led to creating stage sets for opera and the theater. Between 1901 and 1934 he registered more than 20 inventions for stage lighting systems and machinery for the production of textiles. His fascination with textiles came from his father’s collection of fabrics-including samples of antique materials- and his mother’s preference for the textures and colors of Morocco. Attuned to all aspects of fabric printing he produced many of his own dyes and stencils, never using the exact design and color palette twice. Most of his work was monochromatic-the most notable exceptions were block-printed or stenciled designs with gilt or silver pigments. His material of choice was silk because of its quality, texture and variety of forms and his simple, classic designs were functional as well as non-restricting, which was far removed from the fitted gowns of his contemporaries. With doubt his most famous design (1907) was the Delphos dress, a simple, pleated, satin silk that he reproduced for over 40 years. The finely pleated silk material was sewn in a cylindrical shape with holes for arms and head. All dresses reached the floor, covering the feet. An optional belt could be worn at the waist or under the bust. These dresses were stored by being rolled lengthwise, twisted from both ends creating a coil and placed in a small hat box, which preserved the pleating. He patented this pleating process in 1909, building a factory in 1922 which is still in operation today. 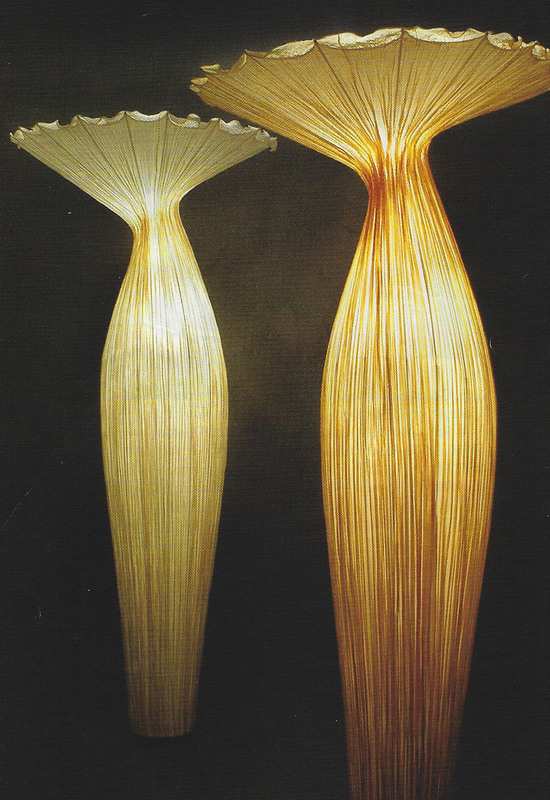 Similar in design are these lamps created by Ayala Serfaty in 1984. They were made of hand-dyed, custom crushed Indian silk in a range of rich colors and neutrals and featured in an article “Leading Lights” by Polly Guerin in Art and Antiques magazine, June 2006.